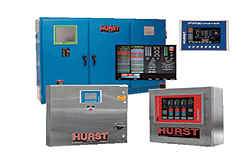 The systems offer higher-efficiency, integrated boiler control with graphical visualization. The information collected facilitates more efficient operational management of boilers and supporting peripherals. Each integrated system provides PLC (spell out) control, variable frequency drives, and HMI (spell out) interfaces devices. The boiler provides insights to energy use, predictive maintenance, and an improved analysis of utility operations.